I realize it may seem anachronistic to be researching LinkedIn through books (and not even e-books, but the old fashioned paper-based kind). However, while it’s entirely possible that the same information may be available through blog posts and other modern sources, if it’s packaged nicely for me and waiting at the local public library, why not give it a try? 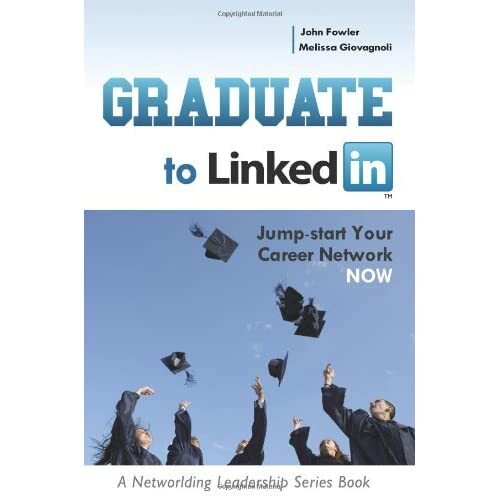 Today I’ll be discussing Graduate to LinkedIn: Jump-start your career network now by John Fowler and Melissa Giovagnoli Wilson. As the title suggests, this book is aimed at university students. The main point is that it’s tough to find a job these days, so it’s important to build business relationships while still in school. In order to do so, you need to take what the authors call the “Networlding approach.” Networlding is a buzz word developed by the second author in a previous book, and what it boils down to is networking in such a way that you form strong, mutually supportive relationships with the people in your network. Personally, I think Networlding is the same as effective networking, but the authors insist that Networlding leads to both internal and external fulfillment, and I have never felt quite that way about my own experiences with networking. The book was published in 2010, so I was concerned that it would seem a bit dated (if that sounds unfair, consider that LinkedIn has been around for less than 10 years, and it has already been two and a half years since the beginning of 2010). Fortunately, I found this was not the case, with the minor exception of a few features that have changed names. I did find an unusually high number of typos, though, and upon further investigation discovered that the book is not printed by a major publisher, but instead by a small press operated by the second author. Less helpful is the second part of the appendix, “other Networlding tools for your career success,” where the second author shamelessly promotes three of her previous books (Amazon.com and Publishers Weekly reviews and all). Final verdict? I would definitely recommend it for business students, who are the book’s target audience. Some of the examples don’t apply to people outside of the business world, but many of them are reasonably universal. At 161 pages for the main text, it’s a quick read, and I can think of many less productive uses of your time, so give it a shot if you’re interested. I can’t help but end by pointing out that while the authors state they are giving half of the proceeds from the book to “initiatives that help 12-29 year olds improve their chances of success in the world,” they don’t specify which initiatives will receive the money, and the first author (who is presumably quite concerned with his own chances of success) happens to have been under 30 at the time of publication. I’ll give them the benefit of the doubt and call it a coincidence. Your site is drupal but it’s wordpress?!!! I’m not sure what you’re asking – feel free to send me an email if you’d like to discuss: glavender[at]gmail[dot]com.